As fall sets in, there are a variety of harvest time celebrations going on in Bellingham. One such celebration is being held tomorrow (Sept 18, 2010) in Fairhaven- a salmon barbeque and sidewalk sale. It’s an annual tradition! Not taken at the Fairhaven salmon bbq, but you get the idea! Photo by flickr user quinnanya. 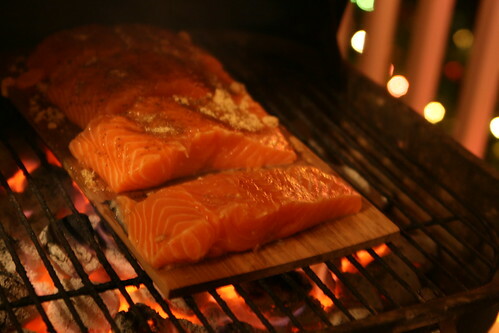 There will be Pacific Northwest King salmon – cooked by fishermen who know the best barbequing techniques. There will also be side dishes, like coleslaw, bread, corn-on-the-cob, a beverage, and dessert. For kids there will be a separate hot-dog meal available. The bbq costs $12, and runs from 1-4. The sidewalk sale will start a little earlier, at 11, and runs til 5. Come get a deal on summer closeouts, from clothes to books to pottery. Here’s your chance to check out all those shops in Fairhaven that might be a little too pricey most of the time. There will be live music on the Fairhaven Green, too. Enjoy! More info at the Fairhaven website.